Photographs of Chris Cornell and Kim Thayil of Soundgarden, taken during the band's 55 minute set at Lollapalooza '92, on Saturday, September 5, 1992 at the Fort Bend County Fairgrounds in Rosenberg, Texas (just outside of Houston, Texas). 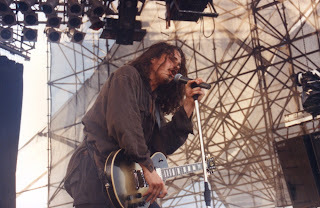 In 1992, Soundgarden was perhaps at its peak, artistically, although it still had commercial success two years in its future with the 1994 release of Superunknown, an album which spawned way too many radio friendly hits for a band with such roots. (If you were in Austin in the mid-1990s, you could not escape the KLBJ-FM television ad featuring "Spoonman."). 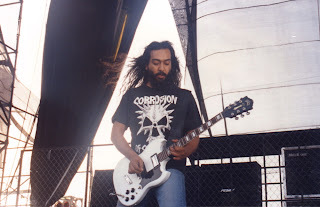 The 1992 tour was in support of 1991's far better, far more original Badmotorfinger (which, if you were lucky, came accompanied by a second disc, the EP Satanoscillatemymetallicsonatas (or SOMMS). In the pre-Internet days, it was a coup to discover such a rarity existed, much less that it could be found at your local record store. As Racine mentioned, before Lollapalooza '92, Soundgarden last played Houston in January of 1992 opening for Guns N' Roses at The Summit. (It seems as if the reference in his review is thrown in there only to alert the reader that yes, he did indeed attend the earlier show, and isn't he above it all of finding it tedious.). By coincidence, the very day before Lollapalooza '92, Guns N' Roses also returned to Houston with Metallica and Faith No More for a show at the Astrodome. Many Houstonians attended both that and Lollapalooza. 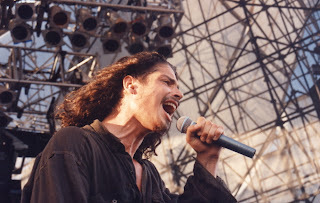 (Soundgarden would play Houston's Astrohall arena in July of 1994 and not play "Outshined."). I didn't bother to check to see if the Chronicle ran a correction, but "Temple of the Dog" was most definitely not a Soundgarden record. It was the self-titled and only album by a group featuring Cornell, Stone Gossard, Jeff Ament, Mike McCready, Matt Cameron and Eddie Vedder. 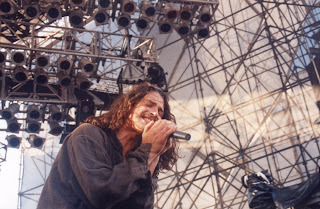 Of the six members, only Cornell and Cameron were of Soundgarden, the rest being with Pearl Jam. (How amusing it is to discover a fifteen year old error.). I couldn't tell you without looking it up when exactly the band fell apart, but I know they did, and that their last work with which I was truly familiar came in 1994. I understand that Cornell later fronted Audioslave, but by that point, I couldn't have cared. And, yes, the photographs above were indeed taken by me, using my photo pass. 1. Racine, Marty. " Lollapalooza!/The music is a decidedly hip, high-strung hybrid of rap, funk and hard, linear beats, laced with a requisite dose of attitude. 'Lots' of 'tude/New generation finds its alternative," Houston Chronicle, September 7, 1992. In hindsight, Soundgarden was probably overrated. I listen to their stuff now, and it doesn't impress me so much. I can't believe this dumbass, overrated, really??? I am a recording engineer and a musician for 20 plus years and I can tell you that it is rare that you get such a body of work from such an experimental or progressive rock band. Long live the Garden. I think Paul's response makes me think RHPT is even more correct in his assertion. I guess it's time to leave another comment, it's been more than two years. Overrated? Who's to say what's overrated and what's not? It's all about what you like. I'm a huge Soundgarden fan, have been since about '90 -- saw them on the Lollapalooza tour in '92. I like everything they've done over their career -- each record has such a different feel and mood. Amazing ear candy for me. I also don't feel they reached their artisitc at Bad Motor Finger, hardly. The next two records are much more diverse from a songwriting standpoint. SuperUnknown is a amazing and Down On the Upside I feel was highly underrated -- some great songs on that one. Anyway, loving the new record and I'm glad they're back after so many years. He was also incorrect about the earlier performances in Houston that year. Soundgarden/Pearl Jam played at the Unicorn earlier that year.